Stunning views into the Kanimbla Valley are a feature of this three bedroom home at Mount Victoria. Cosy wood fire,gas barbecue, free Wi-Fi and linen provided a part of this great package you won't forget. 50km views to the coast and the sunrise are the great features of this large 5 bedroom home at Hazelbrook in the glorious Blue Mountains. New 3 bedroom home on Cliff Drive, Katoomba, close to Scenic World and the Convention Centre. Gas heating, TV and lots of books on hand for a restful stay. Large, freshly renovated 5 bedroom home at Katoomba . Close to the centre of town. Features central heating, a wood fire and plenty of other heaters for those cold nights. Delightful 2 bedroom plus study, freshly renovated cottage in the heart of Katoomba. Great outlook at rear with plenty of space for the family. Beautifully 3 bedroom renovated cottage in the heart of Katoomba, in a quiet location. Delightful two bedroom home at Katoomba, Completely renovated with garden views and easy access to either Leura or Katoomba centres .Cosy wood fire & gas heating for those cold winter nights. Luxurious modern 3 bedroom home featuring central heating, a cosy wood fire ideal for a family. Close to outstanding views and Scenic World's Skyway. Freshly renovated, superb cottage close to shops and restaurants of Katoomba. Great views from garden. Near new 3 bedroom cedar cottage, perfectly positioned to take in the best the Mountains has to offer. Close Scenic Railway, walks and Katoomba Falls. Newly renovated 4 bedroom home with 2 bathrooms located in bush area of Katoomba, close to all facilities and the main attractions of the area. Modern decor in a traditional Blue Mountains cottage located in the centre of Katoomba. Easy walk to shops, restaurants and the marvelous Clarendon theatre restaurant is only 200 metres away. Completely renovated three-bedroom home in the heart of Katoomba. Close to shops and restaurants and with easy access to all of the wonderful sites that the Blue Mountains offer. Sleeps up to 6 people in comfort. Very basic holiday accommodation with a fantastic view. Freshly renovated 3 bedroom family cottage in the heart of Leura close to all attractions. Delightful 2 bedroom cottage located in the centre of Katoomba only 500 m from the shops and restaurants. Self Contained apartment with spa only a few minutes walk from the picturesque Leura Mall, ideal for a couple. Luxurious 4 bedroom home with 4 bathrooms, air conditioned and centrally heated with large patio and views to the rear of the Three Sisters. Spacious three bedroom home in South Leura with large established gardens and outdoor setting. Wood fire. Luxurious, spacious home with stunning views, spa, wood fire, gourmet kitchen and great balcony overlooking the famous 3 Sisters landmark. If you want impressive, look no further! Stunning views of the Three Sisters from most rooms, modern home 3 bedroom with deck and lawn, even an outdoor pizza oven. A holiday to remember forever, book now. Delightful LAVENDER COTTAGE, two bedroom fully equipped cottage with all home comforts plus a lovely garden, close to the shops and restaurants of Leura. Short walk to the railway station. Compact two bedroom home with excellent lounge and cosy gaslog fire. Large, private backyard with mature trees. Large deck at rear overlooking garden. Well equipped, self contained motel style room right adjacent to the Leura golf course. Lynton a tastefully furnished traditional 2 bedroom mountains cottage, minutes (450 metres) from Leura Village. Large, stylish older style mountains home at Leura with central heating and a cosy wood fire with a bush outlook. Interesting cottage set high over a valley and in natural bushland. Great views and very private. A unique feature of this property is that it is a working observatory for star gazers. Three bedroom holiday cottage at Leura with delightful bush aspect. Tanglewood is a delightful two bedroom house nestled in an expansive, 1500 sq metre, mountain garden. Traditional rustic mountain cottage, set in orchard with fruiting apple and plum trees. Sunny garden, north-facing veranda. Quiet lane way, off street parking. Clean modern two bedroom brick cottage close to the Wentworth Falls Lake and the adjacent bushwalks. 4 bedroom split level house with views to Mt Solitary. Plenty of heating in each room, wood fire in the study, gas heating in the living area. Stunning views! Two bedroom luxury home close to the Conservation Hut Restaurant and Wentworth Falls walks. Modern 4 bedroom home with two bathrooms, close to shops, transport and restaurants at Wentworth Falls. Delightful aspect to garden. Beautiful artists cottage. Comfortable and welcoming with a slow combustion fire, central heating and more. Set in a lovely garden - a magical getaway! Three bedroom airconditioned two story cottage at Blackheath with wood fire. Centrally heated three bedroom cottage with huge deck in leafy setting at Blackheath, featuring wood fire, off street parking and large garden. Delightful, sun filled 3 bedroom cottage in leafy Blackheath with easy access to bushwalks and the centre of town. Economical modern three bedroom duplex very close to the golf course at Blackheath and approx 1km to the centre of town. Leura is a village that captures the spirit of the Blue Mountains. Stunning tree-lined streets of mountain cottages are a pleasure to walk around in any season. Lined with cherry blossoms from top to bottom, Leura Mall is a delight to visit. Boasting café’s with fine food and coffee, boutique shopping options of both vintage clothing and wares, upmarket retail and locally crafted art and crafts, a whole day could be passed simply enjoying the immediate pleasures of Leura Mall. A popular village for romantic getaways, Leura has a variety of exceptional restaurants for an evening out or special occasion. Find your ideal Leura accommodation below, or use our advanced search to search by availability and accommodation features. If romance is in the air, take a look at our romantic getaway accommodation page. 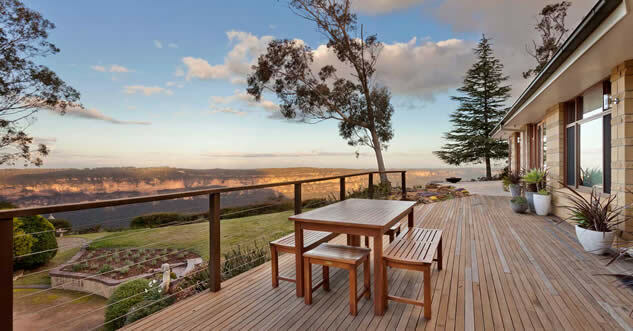 Incorporating holiday homes formerly managed by Soper Bros Real Estate & Leura Real Estate, Leura since 1913. Copyright © 2019 Blue Mountains Accommodation Centre | Blue Mountains Website Design by iVent.